On Sunday, former Asst. 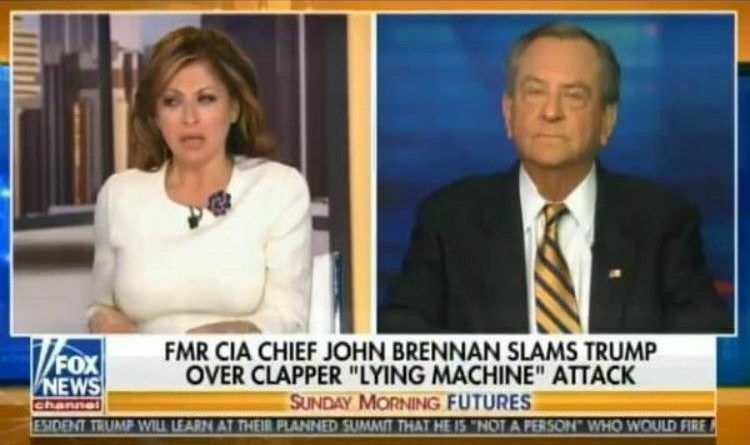 FBI Director James Kallstrom appeared on ‘Sunday Morning Futures’ and told host Maria Bartiromo he has “no doubt” fired FBI Director James Comey conspired with former Director of National Intelligence and Former CIA Director John Brennan both conspired with Comey to take down Trump. Brennan, Clapper, and Comey…thought they were the Three Musketeers, found out they were just the Three Stooges. The FBI never did a real investigation into the Clinton email scandal, and only “re-opened” it after the missing emails were found on Weiner’s laptop because the NYPD was about to blow the whistle. And again, the FBI simply ran cover for Clinton and didn’t do any investigative work. Meanwhile, the coup attempt by the DOJ, FBI, and Obama administration continued. Luckily, it takes just one whistleblower to bring down the house of cards. Any reasonable person can see exactly what is going down here. The rats never dreamed they would be outed since Hillary would win in a cakewalk. Now that Trump has ascended, those same rats are trying to bring down Trump before the ship sinks. The Trump conspiracy is actually more of a cover-up for Hillary, Obama, Comey, Lynch, Brennan, Clapper, and the rest of the not-so-merry band of political crooks, liars, and conspirators. At this point, the “investigation” is so tainted that it would ironically serve to indict and spotlight the accusers, not President Trump. Perhaps there will be a sublime day when they are all perp walked on camera. Now, THAT would be a start to get justice.